Hello lovelies! I don't know why, but I've always loved the thrill of recieving a package in the post and so when this little box of Vegan Goodies arrived on my doorstep on Wednesday I could not have been more excited! 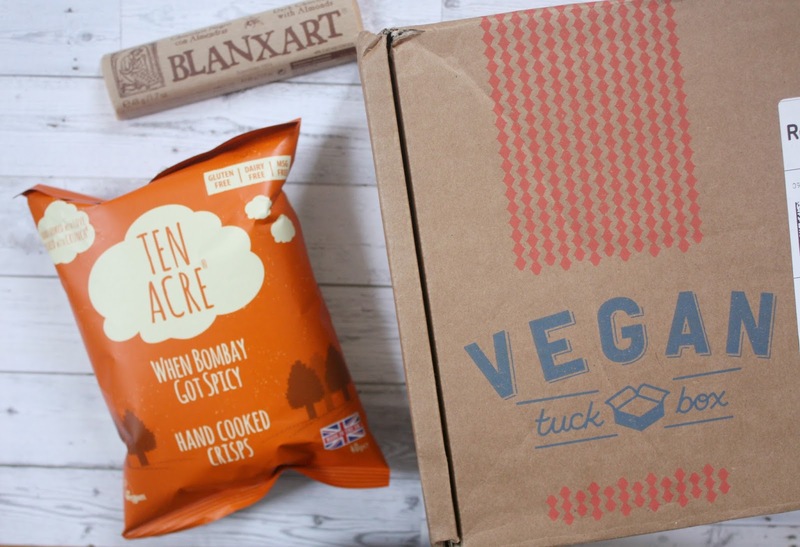 A couple of weeks ago, The Vegan Tuck Box offered to send me one of their selection boxes to try out after I mentioned that I was trying Veganism for the week and so I thought a Huge Haul post was definitely due - plus a chance for me give review and give you all an honest review on what I thought of this box of goodies. 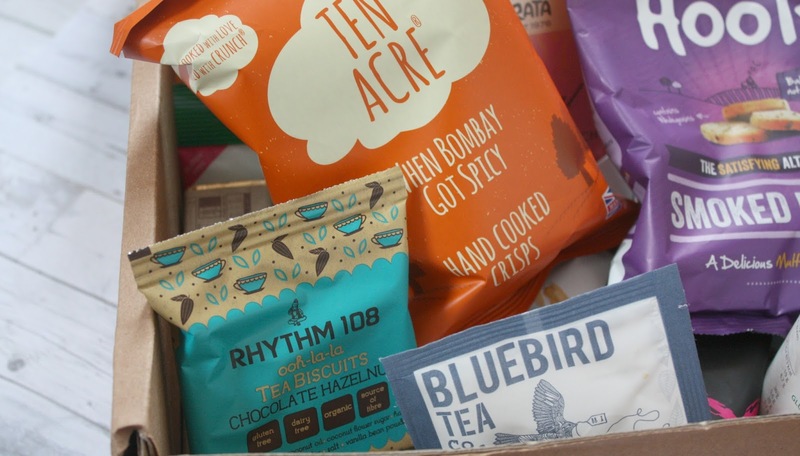 Over the course of this week, I've been trying a bunch of the snacks, some I absolutely LOVE and others that I didn't get along with as much, but that's all part of the fun of a subscription box right? 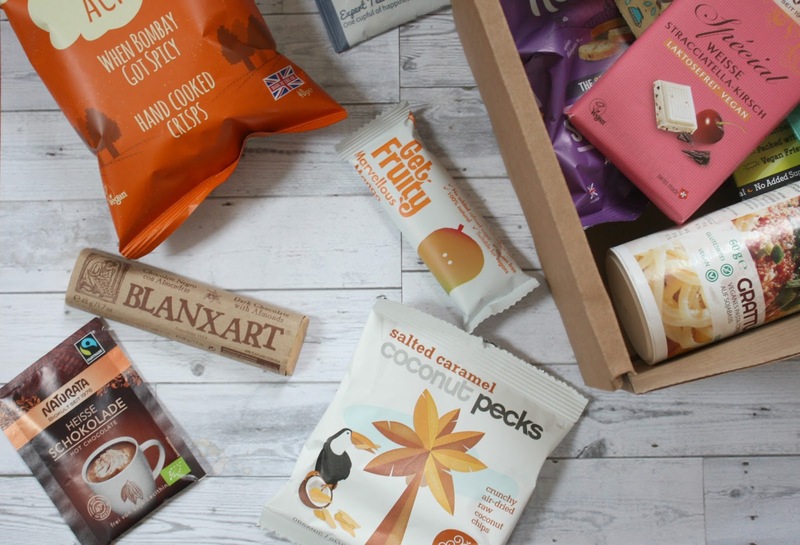 Overall though, I absolutely loved this box and I think it was the perfect start for me as 'beginner Vegan' if that's even a thing, filled with so many delicious and healthy snacks to stop me missing all the egg or dairy filled foods. It definitely beats searching forever in the 'free-from' section of Asda, that's for sure! The online price of the selection box I was sent is £18.50, and this included 13 sweet and savoury snacks for me! The company was founded by two Vegans themselves, and so everything inside is handpicked and chosen especially for each month. Although what I love, is if you're not quite ready to commit to a subscription box (since I know how pricey they can be!) you can order single boxes like this selection one, or the 'gluten-free' or 'chocoholic' one to give it a go. 10p from every box purchased is also donated to vegan causes each month. I had tried Vegan crisps in the past, but I have to say they'd all been a bit 'mehh' while this one I absolutely love. Perfect for bringing in a packed lunch, in fact my friends ended up eating most of it for me they liked it that much too! I love the fact that something as simple but oh so appreciated like a hot chocolate sachet was included in the box! This was delicious and I had it on a Friday night in while watching coronation street hehe. Such an indulgent bar, with dark chocolate and almonds mmmm. This is definitely something I'll be searching the shops for again, it was amazing. At first I thought it was a bit of an odd thing to find in the tuck box, but as I went through my 'Vegan Week' I quickly appreciated having this. This powdered cheese was useful in so many of my Vegan lunches and dinners, my fav was when sprinkled onto my mini Vegan Pizza! Something about this, I just wasn't a fan of. If you're into something super sweet then you'll probably enjoy this a lot more than me, but I found it a bit too much for me and I would take the Dark Choc and Almond Bar over it any day! I wasn't too keen on these simply because I'm not the biggest fan of chickpeas. I gave it a go and ended up giving my sisters the bag, but they absolutely loved it actually. Each to their own, right? 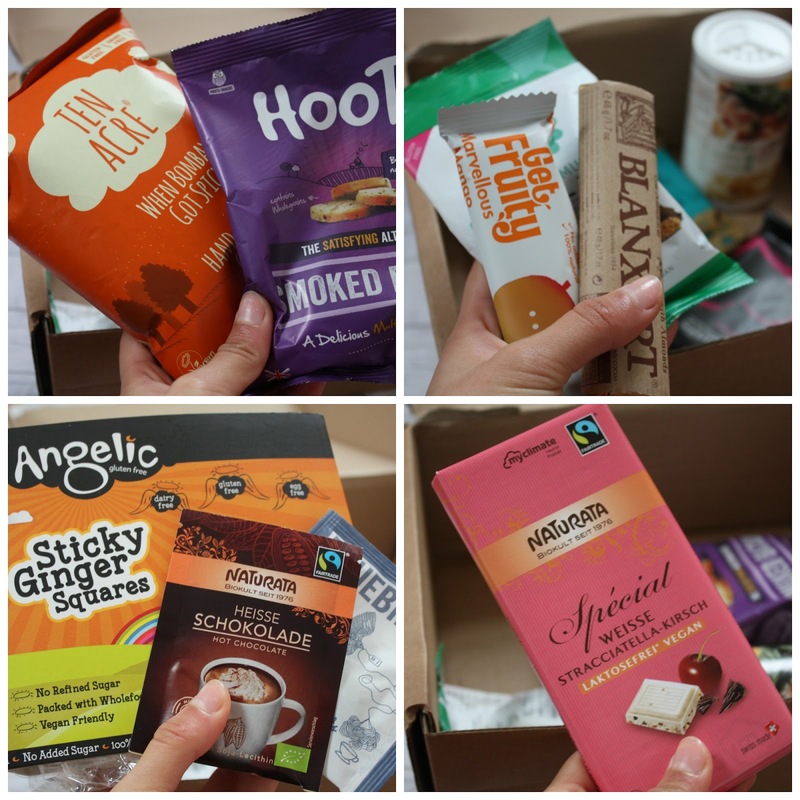 I feel like this box was the perfect thing for if you're a 'vegan-newbie' like me, and since you can order single boxes I will definitely be ordering a new one soon (...maybe the chocoholic one!) As you can see from my lil snack reviews, it's also a really good way to try out Vegan Healthy snacks that you may not have even heard of before and find your favourites in the box. Plus, you don't actually need to be Vegan to enjoy them - they're delicious regardless! In terms of the price, I'd say this is really great value for all the snacks that you get inside, it's absolutely packed with goodies worth every penny and so if any of you are interested in trying this for yourselves you can even use my 20% off Code 'blog20' at the checkout and let me know your thoughts on all the snacks! Hope you enjoyed this Vegan Haul post and I will speak to you lovelies in Sunday's post. 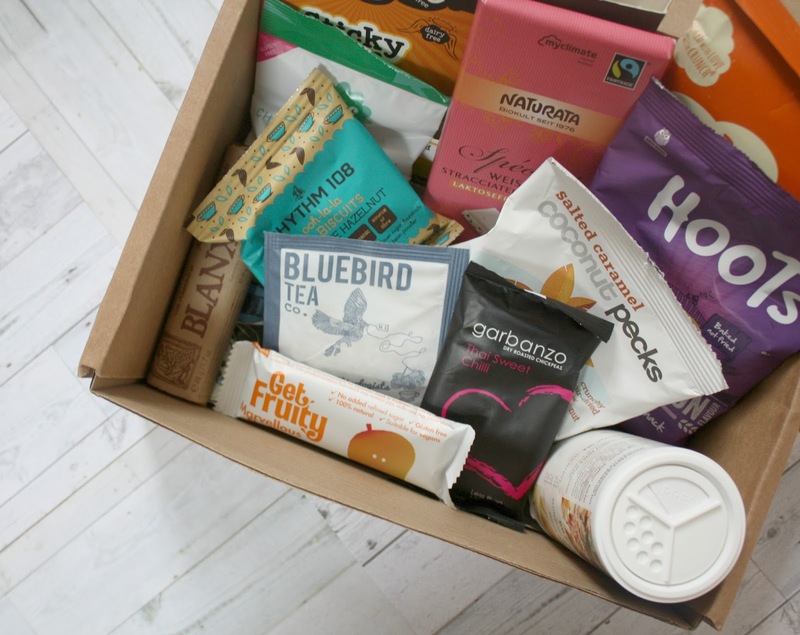 QOTD: WHAT ARE YOUR THOUGHTS ON SNACK SUBSCRIPTION BOXES? Wow, it's great to see all dietary requirements catered for in subscription boxes these days! I am a fan of vegan cheese, I tried it recently and was pleasantly surprised! I must admit that I'm not the biggest chickpea lover either! Fab photos as always! Haha I hope you love it as much as me!